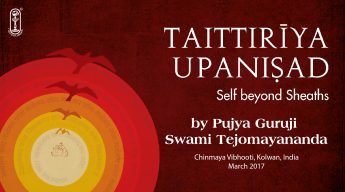 Swami Tapovanam was a Mahatma, a true Vedantin of deep devotion who attained the highest spiritual realization. He chose to remain in his humble, mud-plastered one-room kutia with a small verandah in Uttarkashi. He lived away from the worldly, materialistic life, reveling in His own Self. He despised all ostentations, physical and mental. He recommended study, reflection and attempts at direct experience. 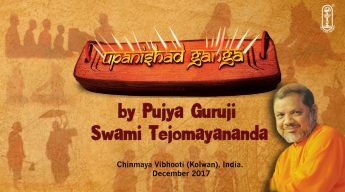 Tapovanji Maharaj was the Guru of Pujya Gurudev. 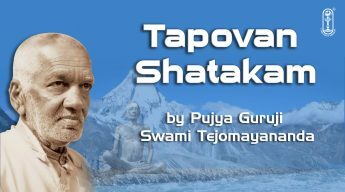 Tapovan Shatkam is a prayerful hymn, a salutation to this great master composed in the vocabulary of the Upanishads which invokes the Supreme Self and identifies that Self Divine with Swami Tapovanam. Vedanta is the valid means that reveals the Truth. It makes us think about our relative relationship with the world and God and our essential nature. Any knowledge that cannot be lived is of little use to us. 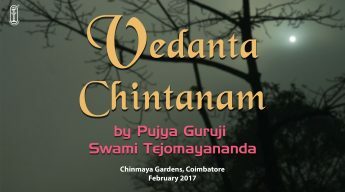 Swami Tejomayananda’s Vedanta Chintanam is a practical guide for living staggering facts of Vedanta like, I am infinite, the world is an appearance and God and I are essentially one! 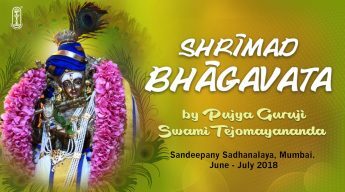 Swami Tejomayananda’s discourses strengthen our knowledge and our resolve to live Vedanta and become fearless and happy. 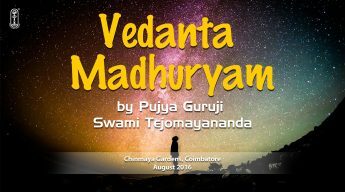 Just as a dry fruit is loaded with sweetness, Pujya Guruji Tejomayananda highlights that Vedanta though may appear dry, is extremely sweet. Can something about our own Self be bitter to us? Vedanta deals with the nature of our Self, thus its sweetness.